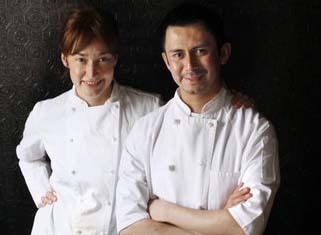 “Miguel Torres, 31, came to the United States from Mexico at the age of 18, knowing very little English, and with only an uncle’s promise of a dishwashing job at a Chapel Hill restaurant…..
“Six months after Torres arrived in Chapel Hill, chef Bret Jennings took over the restaurant, turning it into Elaine’s on Franklin. Torres climbed the fine-dining kitchen’s hierarchy: dishwasher, prep cook, line cook. 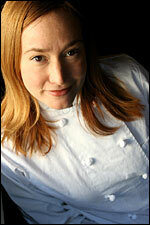 “When Lantern opened across the street in late 2001, Torres got a second job there working as a pastry assistant. Torres worked 80 hours a week, splitting his time between Elaine’s and Lantern. Eventually, Reusing offered Torres more money to come work for her full time and he left Elaine’s. Cook grits according to package instructions in milk or water. Turn off heat. Add cheddar cheese, Parmesan cheese, butter, salt, white pepper, cayenne pepper and Tabasco. Stir until mixed. Set aside and keep warm. Dice bacon and saute lightly until edges are brown but bacon is not crisp. Remove, drain, set aside. Add peanut oil to skilled to make a layer about 1/4 inch thick. Pat shrimp dry, add shrimp to hot oil in even layer. Turn as they color. Add mushrooms and saute for about 4 minutes. Add scallions and garlic. heat, stir for 1 minute more. Season with lemon juice, dash of tabasco, salt and pepper to taste and parsley. Divide grits over four plates. Spoon shrimp on top, sprinkle with bacon, serve immediately. 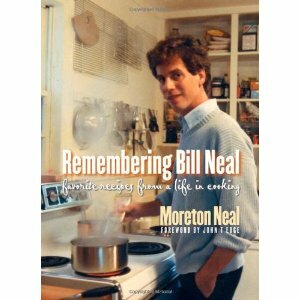 — Reprinted in the News and Observer from Remembering Bill Neal: Favorite Recipes from a Life in Cooking by Moreton Neal. *By the way, if you want a regular supply of seafood fresh from the NC coast, you might consider joining the first Community Supported Fishery (CSF) in the Carrboro-Chapel Hill area. It’s called Core Sound Seafood, offering weekly and bi-weekly shares of seafood from Carteret County, delivered to a convenient local location starting in mid-June. The idea is to connect Down East fishermen to a local, viable market. They have pledged to donate a dollar for every pound of seafood sold to a special assistance fund to help commercial fishing families in times of need. A limited number of shares are still available. 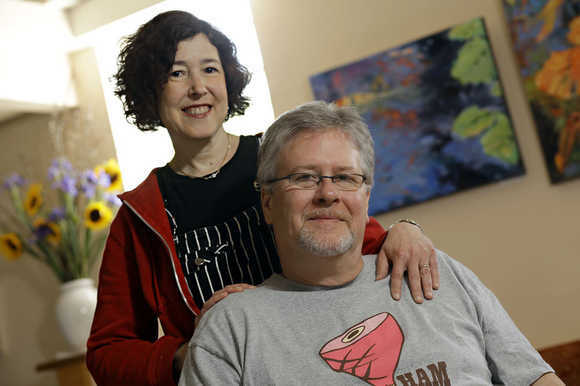 Karen and Ben Barker, the chefs/owners of the award-winning Magnolia Grill in Durham, N.C. “are regular shoppers at the Carrboro Farmers Market. 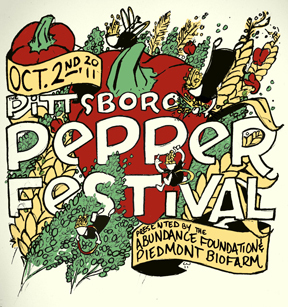 They have long-standing relationships with places such as Peregrine Farm in Alamance County. Their kitchen alumni recall foraging for morels and black trumpets. 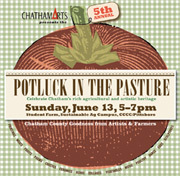 Recent menus tout Columbia, S.C.’s Anson Mills rice, Siler City’s Celebrity Dairy cheese and Chapel Hill’s Eco Farm arugula. –Andrea Weigl, “From Two Chefs, Many,” The News and Observer. Photo by Shawn Rocco.